Are you looking for something different for dinner? This is one of the most nutrient-dense, low-carb meals I have made. It’s fat content is on the low to moderate side and, if you leave off the feta cheese (something I would never do) it becomes very low-fat. On top of that it is easy to make and delicious. You can’t beat that! What is chevon? It is the classy name for goat meat. If you haven’t tried goat meat you really must; as far as ground meat goes it is very mild tasting. It is also one of the healthiest meats available being very similar to many game meats which are highly recommended by many heath professionals. Four ounces of ground goat contains only 2.6 grams of fat with only 0.7 grams saturated. Compare that to very lean ground beef (95% lean) which has 5.7 grams of fat (2.5 grams saturated) or 93% lean ground turkey which has 9.5 grams of fat (2.5 grams saturated). This recipe does leave lots of room for substitution of ingredients, although most substitutions will lower the health benefits somewhat. You could use another ground meat in the place of goat, but remember the comparisons in the preceding paragraph. You can substitute spinach or another green for the kale with a minor reduction in vitamin content. You also could substitute pasta for the spaghetti squash but please don’t! You will raise the carbohydrate level and the calorie level significantly by using pasta. The spaghetti squash will enable you to maintain good blood sugar control and is very diabetic friendly. Heat oil in a heavy frying pan over medium heat and saute red pepper until tender. Add goat meat and cook until no longer pink. Add garlic, salt and pepper and cook over medium heat for a minute. Meanwhile in a 3 or 4 quart covered saucepan heat about 2 inches of water to boiling, Put all of the kale in the pan, cover, and turn heat to low. Cook kale for about five minutes until completely wilted and tender. Drain kale and add to meat mixture. Add tomatoes. Cook and stir until tomatoes are just hot, do not over cook. 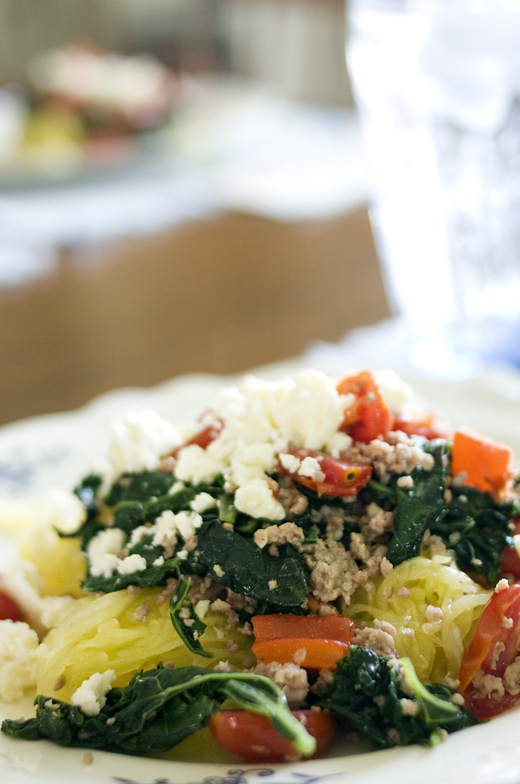 Serve over hot spaghetti squash. Sprinkle with feta cheese. Looking for a source for goat meat? Try an internet search using “goat meat” and your state or region. Also check out some of your local farmer’s markets. There are sources online by mail order, but the shipping is often high. It is very delicious – at least to us. :) I served it to my parents and they loved it. Around us you can get goat at Emery’s Meats on Rt 17 in Augusta. I’m told you can also get it at the Damariscotta Farmer’s market on Fridays (and maybe Mondays). A farm from Dresden sells it there (Dragonfly Cove).